Price Reduced - 10 acres - consists of 3 parcels. Very secluded yet short drive to i-275 and Skyway Bridge. Easy commute to St. Petersburg, Tampa, Bradenton, and Sarasota. Trees. Pond. Old Florida look. $295,000. New Listing - 3 building lots. 50 x 250 for one and the other two lots vary in size. Just off Highway 301 at the Manatee and Hillsborough county line. Wooded. Some live oaks. Great find! For Sale - 2.18 acres - 320 feet on Hwy 41. North of Bradenton. One mile to Port Manatee. Two miles to I-275 and Hwy 41 interchange. Can be rezoned to commercial. 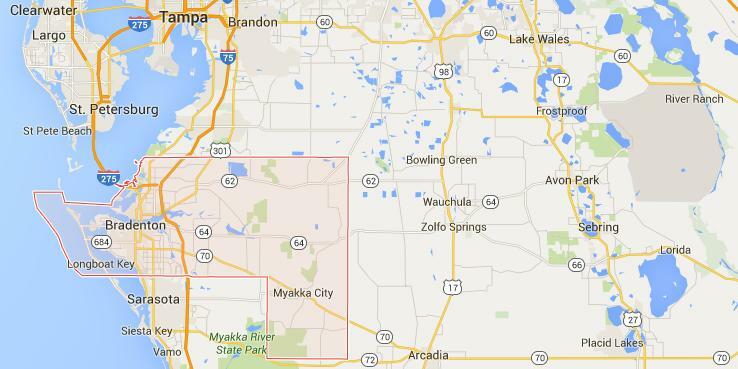 Easy access to St. Petersburg, Tampa, Bradenton, and Sarasota. $125,000. 5.32 acres on SR41 1 mi. S. of I-275 interchange. Wooded w/creek access to Terra Ceia Bay. Owner financing possible. 82 ft x 150 ft lots, NW Bradenton, 3 available, great location, park like setting near Desoto Memorial National Park.